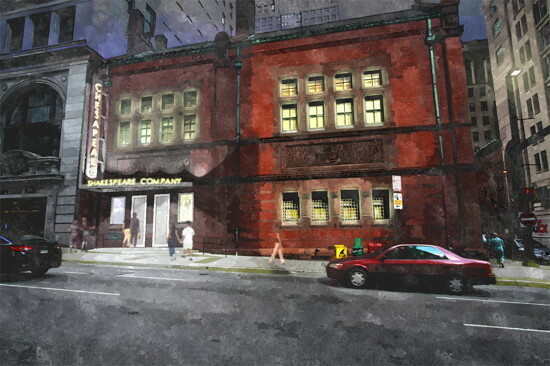 Chesapeake Shakespeare Company downtown Baltimore theater. Credit: Cho Benn Holback + Associates. 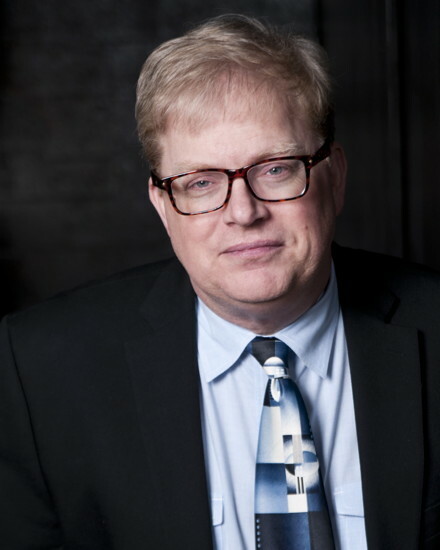 Ian Gallanar, the founding Artistic Director of the Chesapeake Shakespeare Company, has directed over 120 productions over his 30 years in the profession, including CSC productions of Romeo and Juliet, A Midsummer Night’s Dream, Hamlet, Cyrano de Bergerac, Twelfth Night, Macbeth, and King Lear. Gallanar is a recipient of the Telly, Helen Hayes and Howie Awards and has even written a number of plays for children. But none of this could have prepared him for his latest artistic endeavor: having a roof over his head. In a few short months, CSC is moving into a newly constructed, 20,000 square-foot space in the Mercantile Trust and Deposit Company building located at 200 East Redwood Street in downtown Baltimore. The building, built in 1885, was listed on the National Register of Historic Places in 1983. Outdoor Shakespeare fans need not worry because CSC will still offer a full summer season in their outdoor home at the PFI Historic Park in Howard County. I recently sat down with Gallaner to learn what’s in store for CBC audiences. Ian Gallanar, Founding Artistic Director. Photo by Teresa Castracane. Why did you decide to move into this particular building? Oh, for a whole bunch of reasons. Firstly, it’s a beautiful old Victorian building in the heart of Baltimore, just a block and a half from the Inner Harbor. It is easily accessible for the entire region. People are used to coming to the Inner Harbor to enjoy themselves. So, we hope they will think of us in that context. Also, it is located on a block or two of Downtown Baltimore that, when we purchased the building, was suffering a bit from being in transition- with some empty buildings and all that accompanies that. However, I’m thrilled that, since we purchased the building in May 2012, a number of nearby properties have been purchased and are either presently or soon to undergo renovations. New hotels, apartments, restaurants and retail spots are being built. That’s pretty exciting. The notion of making a difference in a downtown neighborhood is thrilling to us. We believe that this project served as a catalyst for a new exciting era for Downtown Baltimore. Before we’ve even opened the building, we see evidence that this is occurring. Lastly, and most importantly, the interior of the building (which was built to be a bank and served this function for a century) is gorgeous and follows the silhouette of the great Elizabethan outdoor playhouses. Of course, the big difference is that we have a roof! Managing Director Lesley Malin and I immediately saw the potential for transforming this magnificent building into a modern interpretation of Shakespeare’s Globe Theatre. People are going to enjoy the experience of being in this building. I think the Chesapeake Shakespeare Company is known for their performer’s intimacy with their audience. Do you think you can still maintain that intimacy in the new space? Right, so that’s the cool part about the building. It’s a very vertical space, so Cho Benn Holback (the architects) and we have designed a thrust stage with two smallish mezzanines. It has, give or take, a capacity of 250 seats, and the furthest seat is only 30 feet from the stage. The stage is going to be surrounded by audience on three sides, as well as from above. It is designed with intimacy in mind! How many additional shows do you plan to add to your season? We’ll be performing a seven-show mainstage season, with a few other slots for alternative and/or second stage programming. 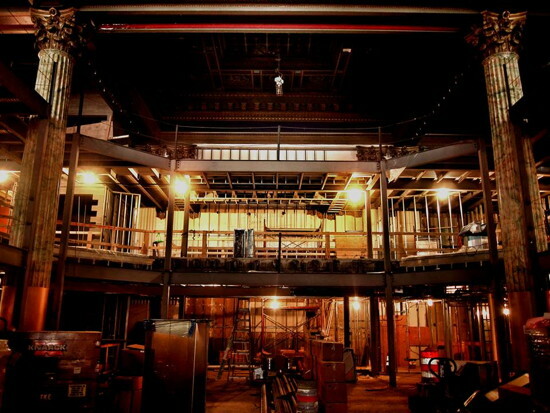 Chesapeake Shakespeare Company theater at 7 South Calvert Street, Baltimore, renovation and construction by Southway Builders. Design by Cho Benn Holback + Associates. Courtesy of Chesapeake Shakespeare Company. 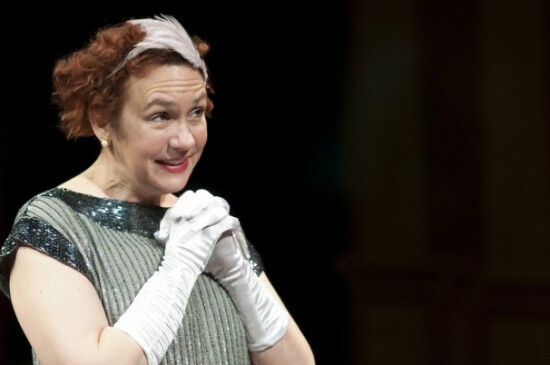 What other playwrights can we expect more productions from? In our first season, we’ll be producing plays by Oscar Wilde, Anton Chekov, and I’m even personally writing an adaptation of Dickens’ Christmas Carol. My prediction is that in future years, you’ll see productions from us by Schiller, Molière, Feydeau, Calderon and maybe we’ll add a play or two to the repertoire by Shakespeare’s contemporaries like Beaumont or Middleton. We like to say we produce “plays by Shakespeare and other plays of classic stature.” We expect to keep to that. Shakespeare will remain our main – but not solitary – focus. I have made a commitment that each season, at least 50% of our productions will be Shakespeare. What other changes are you expecting to make to your company? Well, expansion. This is really not that new for Chesapeake Shakespeare, as we’ve been in an expansion phase each and every year of our 11-year existence. Just since 2007, we’ve more than doubled our size in terms of audience, revenue and staff. We’ll double that again this coming year. We’ve been spending the last two years creating a healthy infrastructure that can support the kind of institutional growth that is going to be necessary. But, still it’ll be a change. We’re going to go from around 60 performances a year to over 125 in the first year and 200 by the third year in the new building. One of the important reasons for having a permanent space is so that we could hold educational programming in-house. We’ve been unable to do that to this point. We serve about 5,000 students a year and with the new building we expect to reach twice that many. Also, we expect to be changed by our relationship with our new neighborhood. We think of CSC as a service organization and that the art we create is the result of a conversation with our audience. As that conversation becomes larger and more diverse, we expect that our work will evolve as a result of that conversation. We believe in creating work together. So, we’ll have new folks and voices with which to work together! The things that won’t change are our adherence to our mission and vision and the organizational culture that we have created and which has enabled us to thrive. We have found that we succeed when we follow our beliefs and priorities and simply get distracted when we don’t. What a nice question to ask! Yes, yes, yes, there is parking. We have an agreement with Arrow Parking for $5 parking in a lot around the corner from the theater. It’ll be easy, inexpensive and convenient. We’ll even have security provided for the block between the parking lot and the theater provided by the Downtown Partnership. 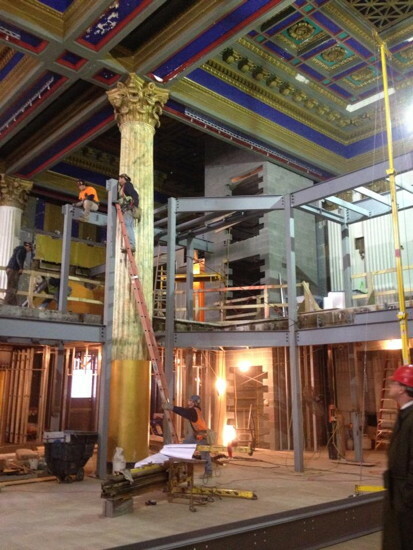 I also love that the building has a past, a present and a future – much like the classical work that we do. I’ve always been very interested in the link between performance space and the work itself. I’ve never much been interested in creating works in voids like black boxes or darkened proscenium theaters. I want the audience and art to share the physical space together. The personality of this building is so strong that it can’t help but to influence the work and the experience. The ceiling is far above and decoratively restored. The theater has gorgeous columns and windows, and the exterior of the building is tremendous. The stone work was taken from the same quarry as the stone work at the Smithsonian “castle.” There is no way to ignore this space while your performing in it or taking in a performance. We’ll not ignore that when creating our work. I know that you want to grow your audience, especially the Baltimore City community. What would you say to entice prospective season members/theatre goers who have yet to see a Chesapeake Shakespeare Company production? The venue itself. For those people not interested in making the drive out to Howard County, we hope that this location is much more convenient. And in terms of the audience experience, it’s also miles and miles and miles above the indoor facilities we’ve been using. Also, let me say that our work has an enormous appeal to new audiences. Our audience demographic skews a lot younger than most traditional theater. In fact, a significant segment of our audiences is made up of people who don’t go to any other theatrical productions than CSC productions. They tell us that they enjoy the informality and the accessibility of the experience. It may seem a strange thing to say about a company that specializes in work that is 400 years old, but we have found a way to make a shared cultural experience enjoyable and something that people from many different walks of life look forward to sharing. We are confident that we can have this new appeal in a larger way in our new space to a larger community. Plus, you know, our shows are fun. People like to have fun! Thanks so much Ian! I know you are busy with your show next show, The Merry Wives of Windsor that opens on February 14th and runs through March 9, 2014. For more information and to get tickets call the box office at 410.313.8661 or click here.